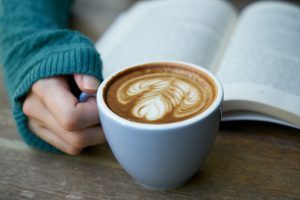 Place your hot beverage order and we have a matching book recommendation for you. You can relax with a freshly made, quality coffee inside the library at Chancez Café in Mill Park Libraryopens a new window or at Thomastown Library there is the Thomastown Neighbourhood House opens a new windowCoffee Cart. They may not have all the beverage varieties listed below but YPRL certainly does have all the books in our collection. Put one on hold and collect from your local branch and enjoy.